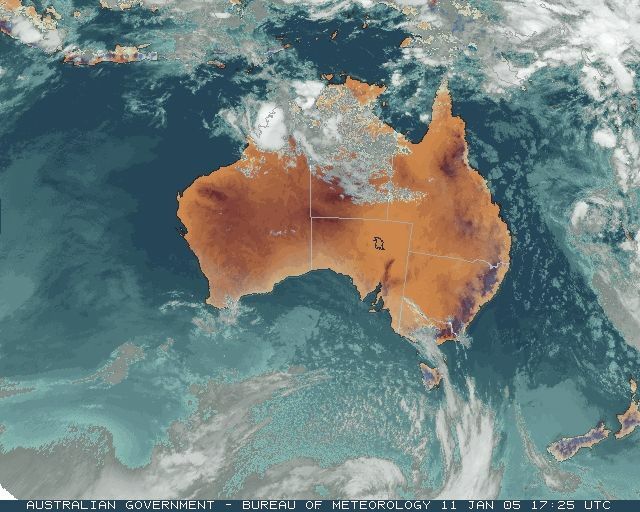 A band of 40+ degree heat with some unusual features extended from the WA Gascoyne to the NSW South Coast today. 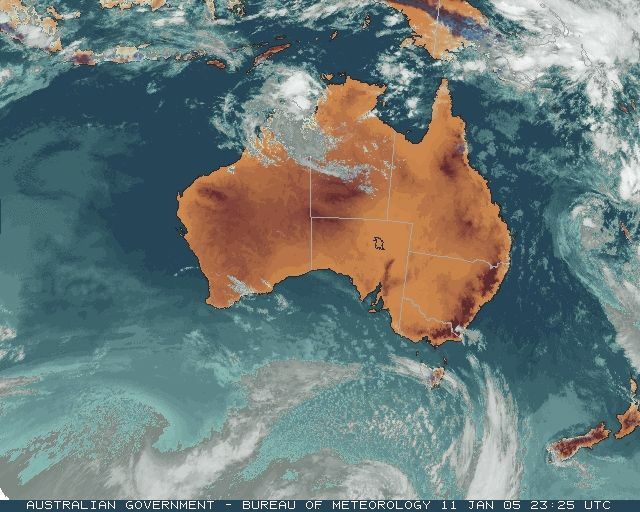 In WA, easterly winds under a low in the Pilbara intensified heat in the Gascoyne. Nyang Station topscored with 47.6, but for nearby Gascoyne Junction the top reading of 47.4 was the weather station's highest January reading in 31 years of computerised record. In South Australia the top reading was 44.9 at Maree while in NSW daytime tempertures peaked at 43.4 at Wilcannia, with White Cliffs, Ivanhoe and Tibooburra all within a degree. On the NSW South Coast, an unusual battle developed between seabreezes and a strong, hot upper northwesterly airstream along a narrow strip of the coastline. At Moruya Airport, an early seabreeze developed blowing at 22km/h at 10am with a temperature of 26.8. By 11am, the northwesterly had blown out the seabreeze, and the temperature had shot to 35.3. It continued to increase to a maximum of 39.0 around 1pm after which the seabreeze reasserted itself and dropped the mercury to 28.0 at 1.30pm. Batemans Bay seems not to have been so lucky, with a 3pm reading of 38.6 and a maximum recorded later in the afternoon of 40.5, a massive 15.1 above normal. 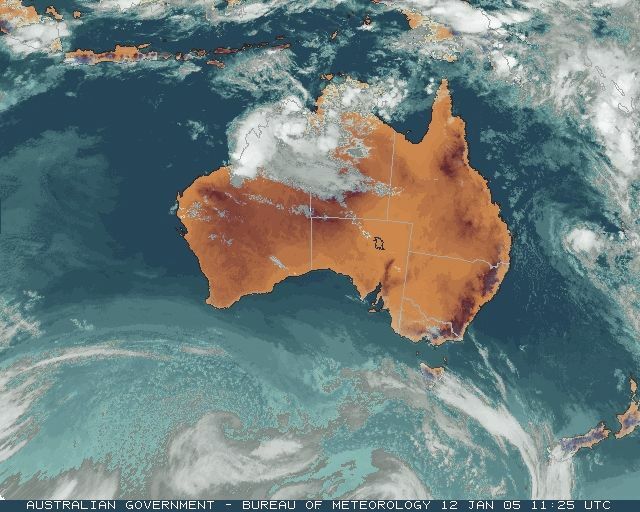 A tropical low in the Joseph Bonaparte Gulf, about 300km SW of Darwin, produced heavy rain across the Victoria district of the NT overnight and in the WA Kimberley today. Victoria River Downs recorded 104.4mm in the 24 hours to 9am, 69 of which fell in the 4 hours to 4.30am. Heavy falls moved into the Kimberley this morning, with most of the rain shown for the 24 hours to 9am tomorrow occurring today. Mount Barnett in the West Kimberley had the top registration of 81.6mm. A strong cold front ripped across TAS during the early hours of this morning giving hurricane-force wind gusts at exposed coastal and mountain weather stations. The front was attached to a 952hPa low well south of the state, and unusually deep low for summer. Top gusts occurred in the tight westerly pressure gradient following the front and included 133km/h on Mount Wellington summit, 131 at Scotts Peak Dam in the Southwest and 126km/h at Maatsuyker Island off the South Coast. 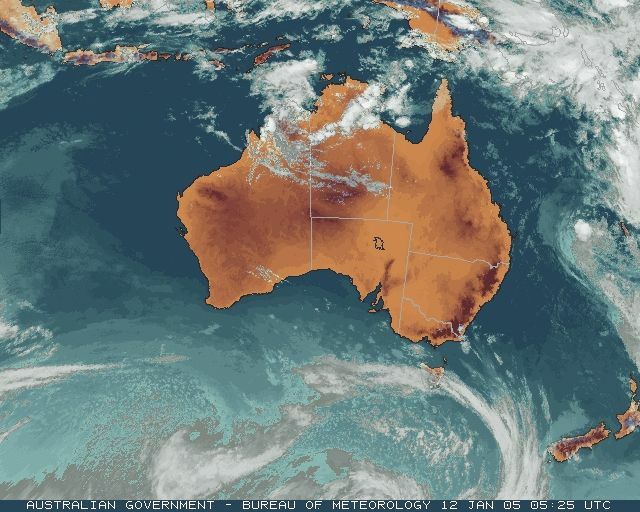 The wind gusted to 76km/h in Hobart City and 85 at Launceston Airport. These records are as received at 1137 EST on 05/02/2006. Help in interpreting these statistics and information on quality control is here.